We know, we know, you’re still enjoying summer and autumn seems a long way off. 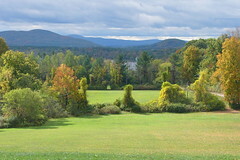 Nonetheless, now is a good time to start planning for leaf-peeping trips to our Berkshires bed and breakfast. Consult your calendars and then consult the calendar of our Massachusetts bed and breakfast. Dream of leaves crunching underfoot while you walk through forests dressed in red, orange, yellow and gold.